Million Dollar Quartet: A classic American Rock n’ Roll Show - And You Can WIN TICKETS! 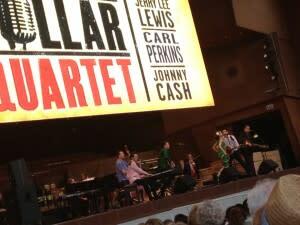 Posted on January 11, 2014 at 5:00:00 am by Michelle M.
Over the summer, I had the privilege of enjoying a concert in Chicago performed by the cast of Million Dollar Quartet. This high energy concert with great American classic tunes such as “Great Balls of Fire” “Walk the Line” and “Blue Sued Shoes” will make you want to dance in the isles. Luckily for us, the Million Dollar Quartet Tour will stop right here in Fort Wayne at the Embassy Theatre. Inspired by the one and only recording session legends Elvis Presley, Johnny Cash, Jerry Lew Lewis, and Carl Perkins ever did together this musical is sure to take you back to the music you love so dearly. These icons would never record together again leaving what many consider invaluable recordings from that night. The music will inspire you, make you laugh, and will stay with you for weeks to come. This single night performance of Million Dollar Quartet will take place Monday January 27 at 7:30 pm at the Embassy Theatre in Downtown Fort Wayne. Tickets are on sale now through Ticket Master or the Embassy box office. Prices range from $27-$57 per ticket with great seats still available. Why not grab a bite to eat before the show? Perhaps something old school and casual like Coney Island hot dog, a Powers hamburger, or a slice from Pint and Slice. Looking for something a little more upscale? Enjoy a pint with your fish and chips at JK O’Donnell’s or classic American cuisine at Don Hall’s Gas House. You can find out more information about Million Dollar Quartet at Visit Fort Wayne. Tickets can be purchased online at Ticketmaster, or through the Embassy Theatre box office. YOU HAVE A CHANCE TO WIN TICKETS! Simply visit the Million Dollar Quartet contest page on Visit Fort Wayne, and enter for your chance to win 2 tickets to the show, a hotel stay at the Courtyard by Marriott Downtown, passes to the Fort Wayne Museum of Art, 2 passes to the Botanical Conservatory and a gift card to DeBrands! You can enter to win until we draw a winner on January 20th!